Does this Chinese Hi=speed train look familiar? these are made in japan by a consortium and based on the E2-1000 series (see link below). there was protest inside china when they first indicated they would go for amore shinkansen type system than a tgv, so they dropped doing it system wide, but then quietly went for the E2 system for some of the trains. long bad blood there and lots of politics in china feed into it all. Jeff, that is fascinating reading. Thanks! Interesting article, I thought the train looked very similar to the E2 series. It will be interesting to watch the development of the rail system in China over the next few years. We were doing a few pre-Olympics films for the Chinese and the one thing they insisted was showing "Modern China" w/new buildings and young people. They wanted a limit of the "Old China" showing very little on the Forbidden City, the Great Wall, traditional clothing, etc. They are becoming a modern country and are doing it practically over night. I like the fact that the Chinese word for shinkansen is shinkansen. Check the wikipedia article here (High-Speed Rail in China) and scroll to the bottom to see the high speed models and the models they are built 'from'. Talk about copy-cats... the ICE 3 (1994) is the original source of information, but the 883 (1995) series is just too similar. Japanese Shinkansen '新幹線' has the same writing and meaning as Chinese Shinkasen '新幹線' because Japanese build their language using a combination of Kanji (Chinese Characters), Hiragana, and Katakana. 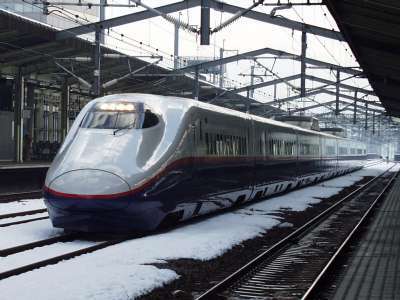 I always thought JR 883 Kamome looks like the ICE-3. Perhaps that's why I have both of them in my collection. Their shapes are irresistible to me. Steven - I like the photo comparison of the Kamome and the Ice 3, until now I really didn't know how similar in design they are. to2leo - talk about comparison, how would you compare the performance of the Kato Kamome to the ICE 3? Minitrix ICE 3 (no directional lights, a bit toy like, thumping motor). BTW, ICE 3 is my second Minitrix, I got to say I am sort of disappointed on the quality, though they are still better than many of the NA brands. The cheap ICE3 sets (without the lights etc) are specifically made to be cheap, so they lack a lot of features. Minitrix also has (or had at least) more expensive ICE's which are quite a bit better. I think the cheap ones were originally designed for starter sets, but they proved to be so popular that they started releasing them separately as well. Are those the ICE 3 sets that come with a battery controller, reason I ask is because I've seen that set listed on ebay and they're not inexpensive. I've allways seen the Minitrix ICE3 in his "poor", starter set, version. Even in the main catalog I've never seen an another version of it. Minitrix are usually very good, way cheaper than Fleischmann but with good quality an detailling. The ICE3 set being an exception, is just to get the kids in the hobby. I've seen the Minitrix 3 car ICE starter sets from Germany listed on ebay from time to time and they start at $100.00 USD. Usually there are no bidders on those sets which got me thinking about their quality. Where? I do like the ICE set but not at that price in the USA. Can it be converted to DCC? The Minitrix ICE 3 has a NEM conector, so it can be converted. You can find ICE at Trix Online Shop. Prices are sometimes better than in French shops, and most of the time higher than in german shops. Yes, it's a good shop. It's where I buy my minitrix tracks. I didn't know this one, usually I just go to Conrad (www.conrad.de) but not to the web site, to the shops. That's the only place I know where you can buy things for half the catalog price... That's allmost how I get re-started in the hobby. I find a starter set (Freight train + battery remote) from Minitrix for 49€... But ok, that's another story.